Artificial Intelligence attack is a new type of WPA hashes recovery developed in our company. It is based upon a social engineering and has never been implemented in password recovery applications yet. This one is mostly used when the hashes are loaded from the local PC. Intellectual recovery scans the local computer, indexes and creates the list of found words and passwords, analyzes them, upon the results of the analysis produces user's preferences, performs the final mutation of the found words and attempts to recover the hash. This attack allows, without resort to time-consuming and costly computations, to recover certain passwords encrypted with one-way functions. The basic idea behind the Artificial Intelligence recovery is that an average user very often chooses similar words and pass-phrases or follows the same password generation rule when creating one's passwords. With that in mind, the attack attempts to figure that rule out and to guess the original password. It is highly recommended to shut down all other applications before launching the recovery. Initiating private information lookup. Here comes into action the password retrieval and indexation module, which looks for all available and hidden in the system passwords entered by a user at any moment of time. Those include network access passwords, ICQ, email, FTP, Windows account passwords, server passwords, LSA Secrets, etc. Data collection and indexation module. During the execution of this module, the program analyzes the activity of the current user (or all users, depending on options set) in the system. Next, basing upon that, the Wireless Password Recovery generates the list of unique words - potential passwords selected from the text files, archives, internet browsers' history, email correspondence, etc. Includes the semantic analysis module for the database of found passwords and the list of words considered as potential passwords. On the final stage, the data analysis module will perform the mutation of the words and attempt to guess the passwords. At the beginning of the recovery, the program will search the system for all passwords it knows of. Currently, there are 38 mini-modules for decrypting system, mail, browser, messenger, archive and other passwords. Then there goes the file and data indexation, along with the course of which the program generates a potential pass-phrase dictionary. The third module breaks the passwords and found words into pieces, out of which in the last module it will assemble new combinations for guessing the original password. Naturally, the more complex is the mutation and indexation level, the more efficient will be the search. However, reaching the topmost indexation and analysis level may take hours and even days, depending on the speed of the password validation algorithm and the number of users in the system. The Artificial Intelligence recovery has proven itself to be most effective for hashes that were loaded from the local PC. Only two options are available here: password mutation depth and word indexing level. 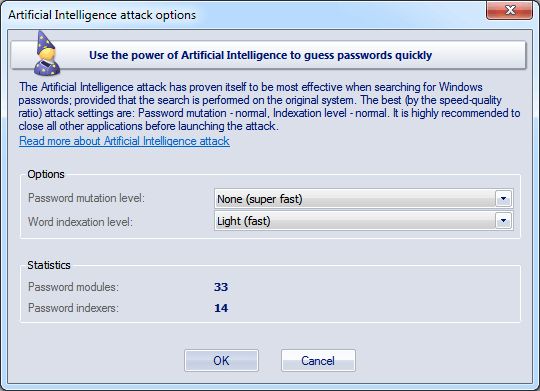 If your Artificial Intelligence attack runs very slow, you may need to remove your program's cached password.